I read The 21 Laws of Leadership several years ago and ate it up. But at the time, I only managed to lead people to eat out with me when I paid. I wasn't able to put the theories into practice. 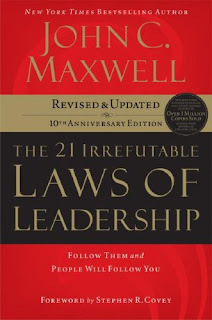 However, new responsibilities at my day job require the ability to influence others, so I'm revisiting the master of all things leadership - John C. Maxwell. This book is great at convincing you that you could effectively lead co-workers, family, or other cars in traffic to rally against the truck that just cut you off. Liz and Dennis. 2gether4ever. See more clips and full episodes of 30 Rock at Hulu.com. You can also watch it the old fashioned way on NBC on Thursday nights. I don't care how you get there, just get there when you can. Shout out Yolanda. A band from Possum Kingdom, South Carolina. I know what you're thinking - they must be phenomenal. And you're on the money. Last week, I recommended a great live band, and Needtobreathe is the first runner up for the tiara. They are a cozy blend of southern and comfort. This song, "Something Beautiful" is from their newest album "The Outsiders." The lead singer's name is "Bear." Remember, phenomenal and coming to a kingdom near you. I had to read 21 Laws @ Beason. Others loved it. I did not. I did not see how it was relevant for me. I will resist someone trying to lead me. I will however follow someone. Does that make even a little sense? Cool. I want to check that book out now. I'm always looking for a good read. J: Followers are a prerequisite for this book to work so thank you! K: The Rabbit Recommends has done its job.